The U.S. Conference of Catholic Bishops has formally announced the second annual Fortnight for Freedom effort to defend religious liberty in the United States. The Fortnight for Freedom will take place from June 21--the eve of the feast day martyr Thomas More, patron saint of politicians--to Independence Day on July 4. Archbishop William Lori of Baltimore, chairman of the US bishops' Ad Hoc Committee for Religious Liberty, will open the 2013 Fortnight for Freedom by celebrating Mass at Baltimore's National Shrine of the Assumption. Cardinal Donald Wuerl of Washington will celebrate the closing Mass at the Basilica of the National Shrine of the Immaculate Conception in Washington on July 4, American Independence Day. "The need for prayer, education, and action in defense of religious liberty has never been greater," explained Archbishop Lori. 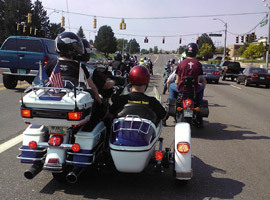 "The Fortnight for Freedom exists to meet that need. This year's Fortnight occurs just weeks before August 1, when the administration's mandate coercing us to violate our deeply-held beliefs will be enforced against most religious non-profits. During the Fortnight the Supreme Court's decisions on the definition of marriage will likely be handed down as well. Those decisions could have a profound impact on religious freedom for generations to come." 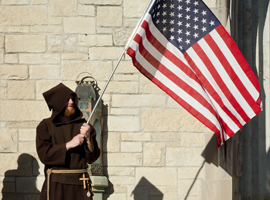 A Franciscan friar unfrults the American flag at the Cathedral of the Immaculate Conception, Fort Wayne, Indiana, during the 2012 Fortnight for Freedom. Resources for the Fortnight are at www.Fortnight4Freedom.org. The site has items such as one-page fact sheets outlining current threats to religious freedom both in the United States and abroad; frequently asked questions about religious liberty, including quotes from the Founding Fathers, the Second Vatican Council and Popes John Paul II and Benedict XVI; and a study guide on Dignitatis Humanae, Vatican II's document on religious liberty. The Web site also lists sample activities already planned in several dioceses, an image gallery of photos from last year's Fortnight celebrations, as well as resources and recommendations for other local efforts, such as prayers for use in special liturgies. 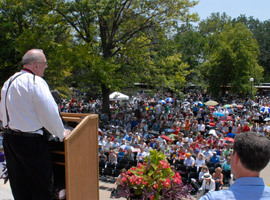 Four thousand gather to hear the Archbishop in Topeka, Kansas for Fortnight for Freedom 2012.